I have been meaning to share for a more than a week now the latest update from Rolando Politi, New York legend and founder of the trash worship movement. 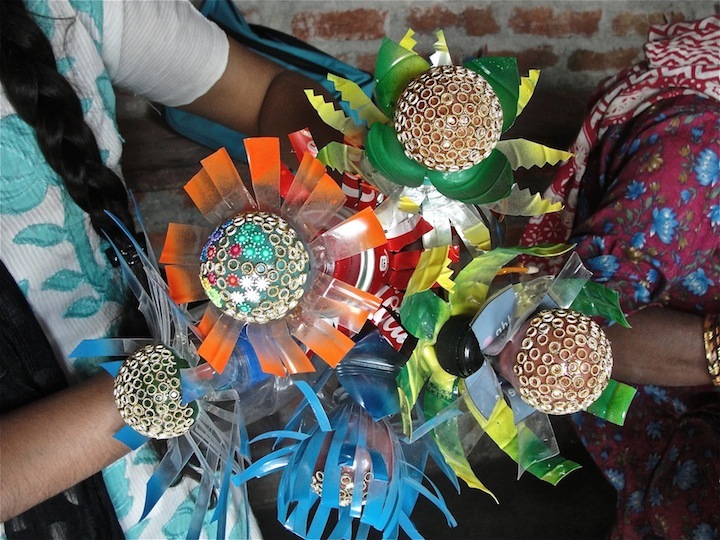 Rolando has long supported an all-woman waste picker’s collective in India and shares, along with these lovely photos, the news that you, too, may support their work by purchasing a flower made from salvaged materials. The co-op in seemapuri is known as “kabad se jugad” (waste improvs) . Right now initial start up funds have all been spent for tools, supplies and rent. KSJ has decided to continue on the risky road of being all independent and self sustaining by the export sales of their unique flowers and mobiles! The price for one flower is $30 (includes export shipping) but if you order multiples, the cost is only $25 each. To order please send mail to recycleandpray@gmail.com. Specify the quantities and your shipping instructions. You need not pay until you receive the parcel in good order! They make a great surprise gift for your loved ones. We ship anywhere in the world and a card from sender can be included! The number of women involved is directly proportional to the number of orders received and just one order for three flowers is enough for one women salary for one month! This entry was posted on Wednesday, August 27, 2014 at 11:17 pm and is filed under Artistic Trash. You can follow any responses to this entry through the RSS 2.0 feed. You can leave a response, or trackback from your own site. Of the grape area harvested, twelve grape varieties comprise nearly ninety percent of the harvest. This is the next thing that should be put on the wine label. writing on the other side. I am Spanish journalist and want to contact you.